Gainesville, Georgia December 11, 2014 — Habitat for Humanity of Hall County is proud to announce the dedication service for their Home for a Hero Project. The event will be Saturday, December 20, 2014, at 11am at 4243 Wintergreen Court. The community is invited to attend and join in the celebration. After searching for 8 months, Charmaine Smith was qualified by Habitat for this unique project. Construction began on the home with a ground breaking on September 6. This is Habitat Hall’s 48th home in 25 years and is their first build as an official Veteran Build Affiliate. Volunteers and financial support have been provided by The Hunter Family, 12 Stone Church, The Wynne Foundation, The Home Depot Foundation, Reunion Country Club and Carriage Automotive Group. The project is the dream of The Hunter Family who after suffering a catastrophic fire, saw fit to donate the property to Habitat for Humanity of Hall County. Their vision was to see a home built that would sustain a qualified veteran and their family in honor of all who serve our community and country. Thus, “A Home for a Hero” project was developed and marketed through efforts of WDUN, Access North Georgia and 11 Alive News. Smith honorably served our great country in the US Air Force for four years. After suffering an injury, she was discharged in 2004. She is the proud mother of sons, Tariq and Dorrian, and daughter, Ellishiah, who are excited to move into their new home. Ellishiah, 7, best summarized the children’s reaction. “I was excited, because we’re moving into a house that doesn’t have a problem with it. We will be safe and can play outside.” she said. Homes built by Habitat Hall County are financed entirely through the generosity of the community. While Smith’s house is not fully funded at this time, Habitat Hall County believed so strongly in giving back to those who have given so greatly for our freedom that the project has been completed. Donations are still being sought to complete funding of the home. Every Habitat homeowner pays for their home. All homes through Habitat Hall County are financed for a 0%, 20 year mortgage loan through Habitat. The homeowner will pay a modest down payment, complete a 10 hour financial education program and volunteer over 300 hours in sweat equity as part of the Habitat program. 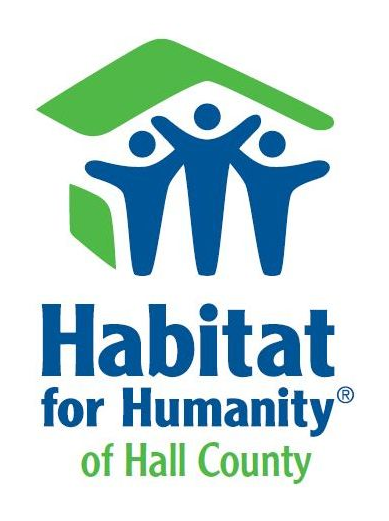 To find out how you can volunteer for a future Habitat project, please contact Lori Crook, Volunteer Coordinator, at 678.450.5998 or volunteer@habitathallcounty.org. To make a donation, please contact Ann Nixon, Executive Director, at 678.450.5998 or executivedirector@habitathallcounty.org.